I love to entertain. Whether I am going to someone else’s house for a get-together or I’m hosting, a party’s no party without an outstanding guacamole! I don’t have anything against the classic version, but every now and then it’s nice to make something with a twist! This bacon and tomato guac can pack some serious heat if you forget to clean out the chipotle chiles, so unless you want to be taking home a lot of leftovers, I would follow this recipe to the tee. Except when it comes to the bacon. Feel free to embellish with bacon. Lots of bacon. 1 bag corn chips to gobble up your guac with! Cut your avocados in half, remove the pits, and cube with a paring knife; then scoop out into a bowl with a spoon. 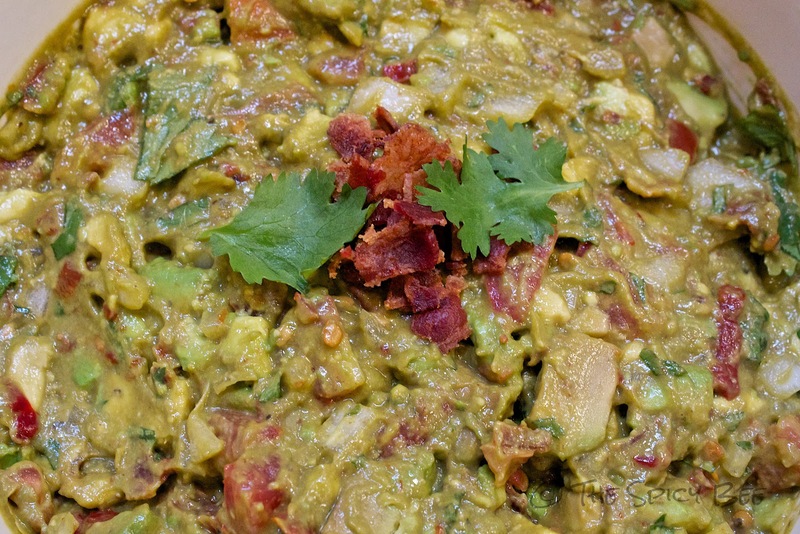 Mash the avocado into a coarse puree and then add the onion, chipotle chiles, cilantro (save some to garnish if you’d like), and about 2/3rds of the bacon. Gently stir to combine, add lime juice, and season with salt and pepper to taste. Cover with plastic wrap directly on surface of guac and refrigerate until serving time. When served, sprinkle extra bacon (and cilantro if you have it) on top and tuck in!